Last Friday evening the 13th of April we defeated Killeagh at home in the Red FM SHL by 1-17 to 1-15 having been behind at halftime by 0-08 to 1-11. A very spirited performance by the team in overcoming a six point deficit midway through the 2nd half to take the valuable points on offer with a late goal scored by the determined effort of Ian Kennefick. This was a boost to the team heading into the 1st round of the SHC on the 29th of April v Bishopstown. We have now won 3 and lost 3 league games in the RED FM SHL . Team: Tommy Wallace, Seanaidh Smith, Alywin Kearney, Adam Daly, Sean O’Leary Hayes (0-02), James Nagle (0-01f), Seamus O Farrell, Luke Dineen, Padraig O Farrell, Paul Haughney (0-02), Aidan Ryan (0-02), Sean O’Meara (0-03), Padraig Nagle, Patrick White & Cormac Beausang (0-04, 2 frees). Subs used Eoin Moloney (0-01), Elliot Mulcahy, Padraig O Keeffe (0-02, 1pt free) & Ian Kennefick (1-0). Last Monday evening the 8th our hurlers had a comfortable win over near neighbours Castlemartyr in the League by 4-17 to 1-19. Due to the unavailability of fields owing to the recent bad weather the game was held in Pairc Ui Chaoimh on the Astroturf pitch. Team: Byran Rossiter, Cormac O’Brien, Adam Daly, Billy O’Shea, Damien Daly, Luke Dineen, Eoin Moloney, Shane Ryan, Padraig O’Farrell, Jake Hegarty, Sean O’Meara, Padraic Nagle, Cormac Beausang, Peter Dowling & Ross O’Regan. Subs used Alan Power, Cathal Gunning, Padraig O’Brien, Cillian Hurley, Niall Walsh, Conor Evans, Shane Finn, Ryan Mc Conville, Mark O’Keeffe, Kieran Mulcahy & Kian Farmer. Our footballers had been fixed to play St Colmans in the East Cork Final last Thursday but very disappointingly the Board decided to call the game off only the night before and no new date has been fixed. 2-24 v 1-11. Panel: Alan Power, Cormac O’Brien, Christian Murphy, Jack Fitzgerald, Cian Murray , Sean O’Sullivan, David Scanlon, Kevin Finn, Sam Quirke, Kian Farmer, Evan Rowlands , Aaron Mulcahy, Cian Crowley, Ross O’Regan & Jake Shanahan. Subs used Tim Sullivan & Patrik Kane. In a recent challenge game we defeated De La Salle from Waterford at home. Panel: Ryan O’ Riordan, Dan O Sullivan, Christian Murphy, Fergus Wade, Patrik Kane, Sean O’ Sullivan, David Scanlon, Griffin Hurley, Kevin Finn, Ethan Daly Harkin, Aaron Mulcahy, Ronan Lynch, Paul Connaughton, Ross O’ Regan, Tim O’ Sullivan, Adam Meade, Kian Farmer, Evan Rowlands, Jake Shanahan and Cormac O’Brien. Training continues this week at the Tech Pitch, let’s hope the weather will be more favourable to us. U8's train at 6-7pm & our U10 group upwards will train from 7-8pm. Don't forget Gumshields. Please be mindful of the Residents in the area when you are parking. Keep up to date with all Club News on our Facebook Page- Midleton Ladies Football or on twitter @midleton_LGFA. Best wishes to our Minor Players Aoife Franklin and Laura O Leary who are currently in Kolkata with the Hope Foundation. We would like to express our Deepest Sympathies to our Junior Player and friend Amy Quirke on the death of her beloved Grandmother Mary Lyons and her Grand Uncle Dommie Heaphy. May they Rest in Peace. New recruits - We would like to extend a very big welcome to our newest magpies, our new bunch of U6’s began their Camogie careers on Friday evening last in the Community centre, we hope to be able to take them outside soon once the weather improves. If you have an under 6 interested in playing Camogie we would be delighted to welcome her, for further information call 087 6822616. 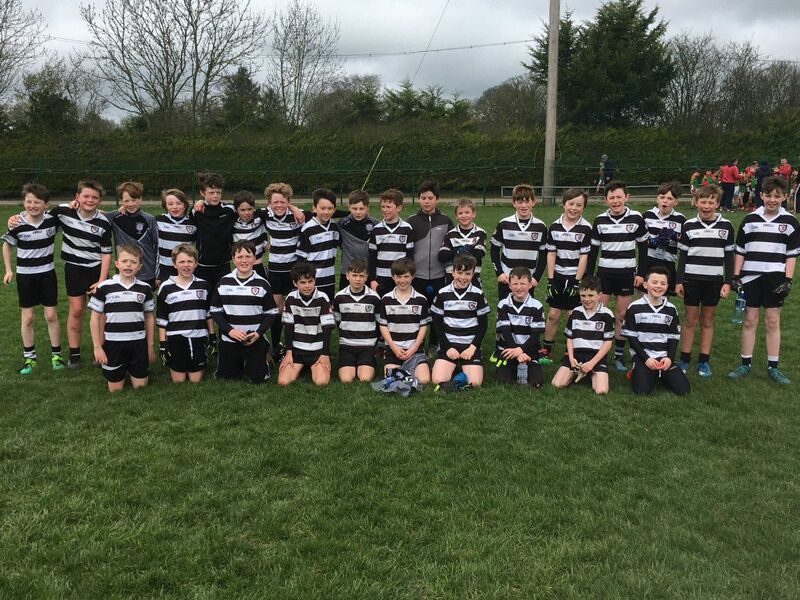 U12 - On Saturday last we hosted our first U12 blitz, with Castlemartyr, Dungourney and Killeagh invited. We had two teams involved and all put in a great performance, with neighbouring clubs involved the girls played with and against school friend making for a very enjoyable morning. Well done to all involved and thanks to those who helped out in the preparations and on the day. It is great to get the playing season started. 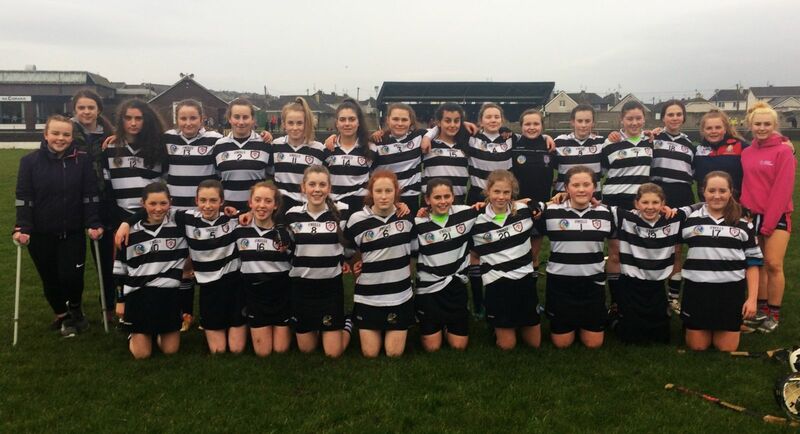 U14 - It was a busy week for our u14’s Feile Semi-Final, on Tuesday night last on home ground we lined out against Rockbán in the Féile B semi-final. Conditions were less than favourable on the night and made for a tough game against two very evenly matched teams. Rockbán started the scoring with a point from a free closely followed by a goal for us Another point from play from us and two points from Rockbán meant that we were ahead by a point at half time. Shortly into the second half Rockbán scored their 4th point and the score line remained even for the next ten minutes until we again inched ahead with a great point from play. Both teams battled hard with the play going from one side of the pitch to the other making for a very exciting match for the supporters. Some great saves by the our goalkeeper denied Rockbán further scores until six minutes from the end a melee in front of the goals led to Rockbán scoring a goal to put them two points in the lead. We continued to hit ball after ball into the forward line but a strong Rockbán defense denied us any further scores and the match ended Midleton 1-2 v Rockban 1-4. This was a huge achievement for these girls who beat Douglas, Brian Dillons, Fr. O’Neills and Blackrock to get to the semi-final stage. Their club, mentors, parents & supporters are extremely proud of them. Congratulations to Rockbán who went on to win the Féile final v Glen Rovers on Saturday last. Panel: Abbie Foley, Chloe Garde, Caoimhe Murray, Yvonne Abernethy, Jill Connaughton, Mia Tarrant, Ellie Collins, Lora Dineen, Elle McManus, Ruthi Hennessy, Emily Lamb, Aoife Fitzgerald, Ella Murphy, Holly Duggan, Rebecca Crowley, Rachel Ryan, Laura Goulding, Rachel Mc Sweeney, Emma Domeney, Tori Buckley, Anna Sheehan & Ines Costa. U14 league v Ballinora - Our second outing of the week was in Ballinacurra to play Ballinora in the second round of the league on Friday evening last. We got off to a strong start with some great scores from play and never looked in danger throughout. Ballinora battled hard but a strong Midleton side denied them victory on this occasion and we went on to secure our second win in their U14 league campaign. U16: We play our first league Match this Wednesday away to Castlemartyr at 6.30pm. Training for the week ahead: U6: Friday Community Centre 7pm-8pm. U7/U8/U9/U10: Friday St Coleman’s 6.30pm -7.30pm. 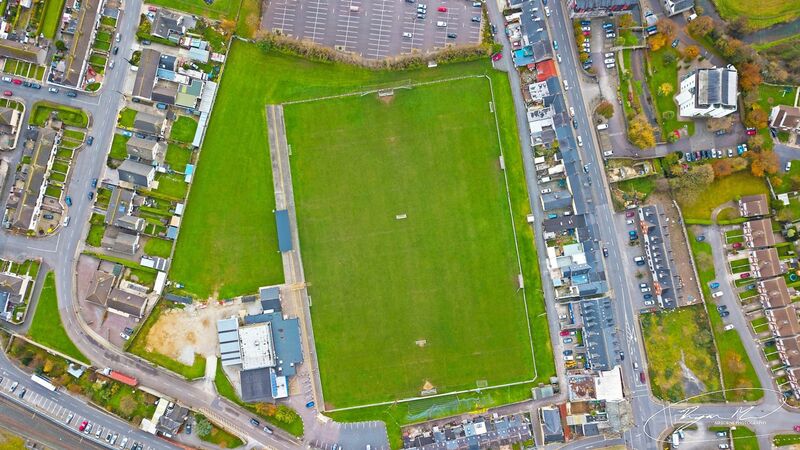 U11/U12: Tuesday St Coleman’s pitch 7.15pn – 8.15pm. Friday St Coleman’s 6.30pm -7.30pm, U14: Friday St Coleman’s 7.30pm- 8.30pm & U15/U16: Tuesday 7.15pm -8.15pm. Friday St Coleman’s 7.30pm -8.30pm. Training is subject to change depending on weather/ pitch conditions, any change to training will be communicated to parents. 11 & 12th of July at East Cork Club, further details will be announced in the coming weeks. The Club Executive would like to express to condolences to the family’s of Mary Lyons and Dommie Heaphy both late of the New Cork Rd who passed away recently. Tickets are on sale at the Club Bar, O‘Neills Bar, Linehan’s Bar, Maple Leaf Bar, O’ Farrell’s Butchers, Frank Murphy Butchers, Pat Walsh Paints, Chadwicks, Teach Beag, Niall Mac’s Bar & Wallis’s Bar. Our Online Lotto is now available, logon to the Club homepage www.midletongaa.com to purchase your ticket. BINGO - BINGO is on each Friday at 8pm, Jackpot €1,000 on 50 calls, Blue sheet is worth €500, everybody welcome. On a dry but windy Saturday morning we hosted St Finbarrs in our second football game of the Go Games League. In total we had 41 players and fielded three teams. All three teams performed well on the day but eventually lost out to a stronger and well drilled St. Finbarrs. Well done to all the boys for their performance and behavior on the day, representing the club with pride. Thanks also to our young whistlers Brion, Alex and Ciarmhac for refereeing the games. Our first hurling game of the Go Games League is at home to Eire Og on Saturday 21st April at 11:15. Panel versus St Finbarr’s was: Hugh Barry, Ryan Barry, Kieran Breathnach, Donncha Butler, Fionn Byrne, Charlie Cahill, Kian Crowley, Leon Davis Farrell, Eoghan Donovan, Dunlea, Alan Fitzgerald, Conor Fleming, Ethan Foley, Adam Groarke, Culainn Hegarty, Alfie Hennessy, Liam Henry, Nojus Jurciukonis, Ian Lambe, Kevin Lester, Ronan Mackessy, Charlie McCarthy, Dylan McInerney, Sean McLoughlin, Daniel Moloney, Ciaran Mulligan, Aaron Murphy, Billy Murphy, Finn Murray, Ciaran O' Brien, Robin O' Brien, Daniel O' Connell, Michael O' Connor, Cathal O' Neill, Aidan O' Regan, Sean O' Regan, Charlie O' Sullivan, John O' Sullivan, David Seale, Patrick Spelman, Manus Stewart & Alex Wilson. 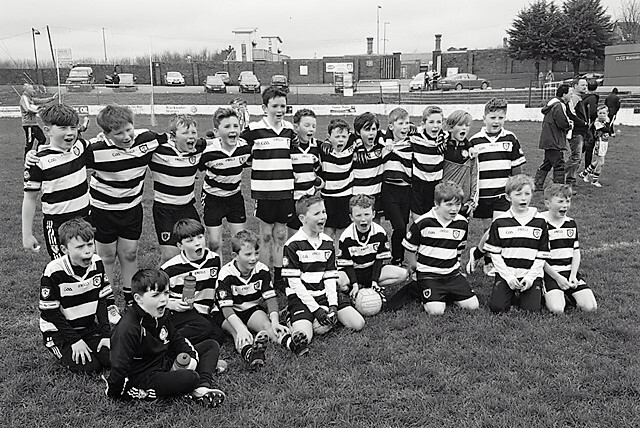 Our boys welcomed Ballincollig to Midleton last Saturday for the second round of the Rebel Óg Football league. 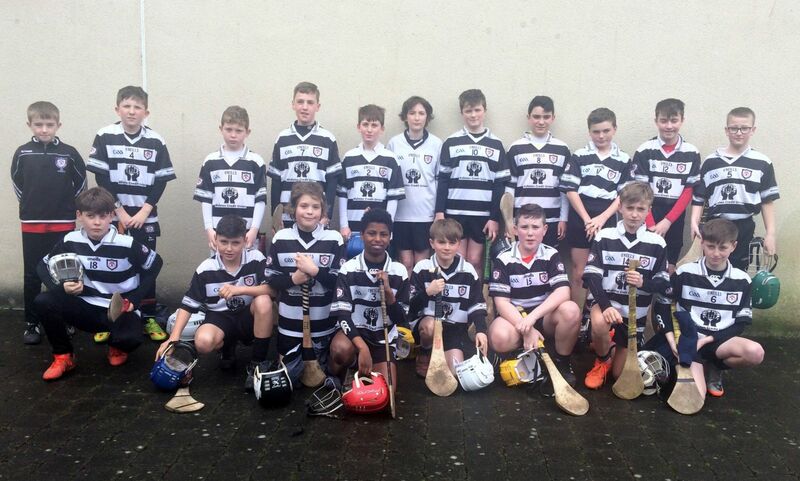 We had a total of 32 boys proudly wearing the black and white across three teams. All teams played exceptionally well with some fine scoring and team play throughout. Well done to all involved and keep up the good work. Thanks also to our three diligent young whistlers, Charlie, Jack and Conor. On Saturday morning last we travelled to Castlelyons for the next round of the Rebel Og Football league. Our opposition were Ballinora, Castlelyons and Fr. O Neills, with 30 magpies primed and ready to take on our opponents. With conditions quiet cool and breezy the boys, in all three games were first out of the blocks and settled quickly. There was some fantastic skill and more importantly teamwork shown from the boys from start to finish. Everyone performed brilliantly and we ran out winners in all three games. This was a great confidence booster because the results on on the field don’t always reflect the effort the boys put in. Training continues this week with our next Hurling match vs Bishopstown this Saturday the 21st at home. Well done again lads on a super effort. 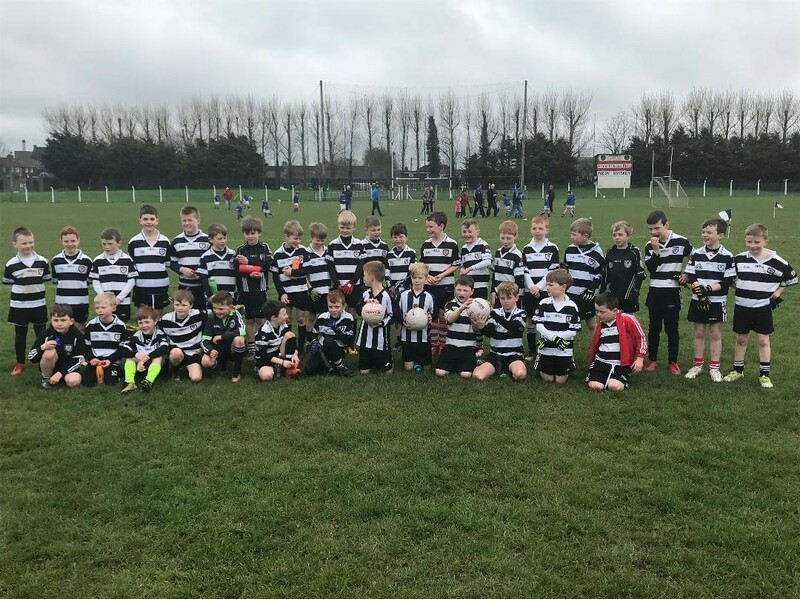 It was a busy weekend for our Fe 12’s Saturday saw us travel to Ballincollig to take on the hosts in what was our first hurling league match of the year. From the throw in it was obvious that both teams were well up for it and evenly matched. The locals went ahead early on with some very well taken points, we responded in kind but a Ballincollig goal put some day light between the teams as half time approached then we lost our centre back Cathraigh Cronin through injury (he was a huge loss) but the lads reorganised themselves and came out for the second half determined to do well. Try as well might we couldn’t find that all important goal to bring us closer on the scoreline and Ballincollig were very efficient with their possession, the final score line of 3.10 to 0.07 was a bit harsh on our lads but we can be very proud of their efforts and attitude on the day. John Paul McManus and Conor Williams had excellent games as did as did Tomas Dunlea Adam O’Connor and Daniel Garde. On Sunday we were on the road again making the long trip to Mallow, for our second hurling league match, with underfoot conditions very sticky but luckily enough the rain held off for the most part. We started this match with great intensity and took the lead through a Daniel Garde 65 that went all the way to the back of the net. Playing against a very strong wind we dominated in most sectors of the field, crashing in two more goals and two points before Mallow registered their first point. Half time saw a change around with us playing with the strong breeze which for some reason seemed more of a hindrances than a help, the hosts fought their way back into the game with two well taken goals we responded with a couple of scores that kept Mallow at bay, at the full time whistle the score was Midleton 5.03 v Mallow 3.01.
defence. James Mc Sweeney and Peter Barrett did really well in the middle third of the pitch while Jake Kirby and Shane McNamara let the attack. Well done to all the lads and their parents there was a lot of travelling this weekend. Next weekend sees us with two home fixtures. We recently played two challenge games in preparation for the new hurling season. The team has been training hard for the last few weeks, as this year we have a very busy schedule with League, Feile and championship in both codes. Our first challenge game was away in Aghada on Wednesday 28th March. This was our first hurling game of the year so it was a great opportunity to get the entire panel out on the pitch. Our second challenge game was at home to Kiltha Og on Monday 2nd April. This game was played on a heavy pitch but the entire panel put in an excellent performance and produced a fantastic result. Both games allowed for the entire panel to get some much needed game time and to build confidence before our league campaign begins. David Cremin, Fionn Dalton, Cathal Beausang, Dara Scanlon, Alex Moloney, Niall Lang, Tadhg Bohan, Tadgh O’Leary Hayes, Darragh Fitzgerald and Zach Smith. Mallow started to settle into the game with a few scores, but our defence held out with some fantastic hurling. Our goalkeeper pulled off a fantastic save helping to keep us well in the lead. We then scored a third and fourth goal, followed by points from play and some well taken frees to leave us leading at halftime, 4.08 to 1.05. The second half started in much the same way with some fabulous passing between our midfielders and our forwards leading to some early points. Again, as in the first half Mallow tried to get back into the game but our defence held out brilliantly. The Mallow dangermen were kept quite only scoring from frees due to excellent man marking. We made some substitutions to keep our momentum going and this lead to two more goals and some excellent point scoring. This was a fantastic display from the entire panel and the victory was well deserved. Full time score 6.19 to 3.11.
received a red card. Half time score Midleton 0.04 v Na Piarsaigh 1.04. The second half was a similar story. Both teams matched each other on the scoreboard. We were back in the game following a goal and some well worked points. With only a couple of minutes to go we were only a point down. Unfortunately, Na Piarsaigh took the remaining chances that came their way and finished out as winners. Full time score Midleton 1.07 v Na Piarsaigh 2.08. This was a game of missed opportunities. We have the chance to bounce back quickly this Saturday 21st April when we travel to Castlemartyr for Feile. Dalton, Cathal Beausang, Dara Scanlon, Alex Moloney, Niall Lang, Tadhg Bohan, Tadgh O’Leary Hayes, Darragh Fitzgerald and Zach Smith & Evan McGrath. Panel: Brion Saunderson, Lam McGrath, Fintan Greenwood, James O’Sullivan, Adam Fay, Ciarmhac Smyth, Evan McCarthy (0-01), Evan Kelly, Darragh Codd, Kelvin Barry, David Cremin (0-04), Mikey Finn, Alex Quirke (1-05 (0-04f)), James Condon, Darragh McCarthy (0-03), Cian Murray, Ben O’Neill, Rory Hartnett Neil Fitzgerald, Tomas Lambe, Niall Corcoran, Phelim Magann, Craig Collins, Roan Spillane & Shay Bohan. 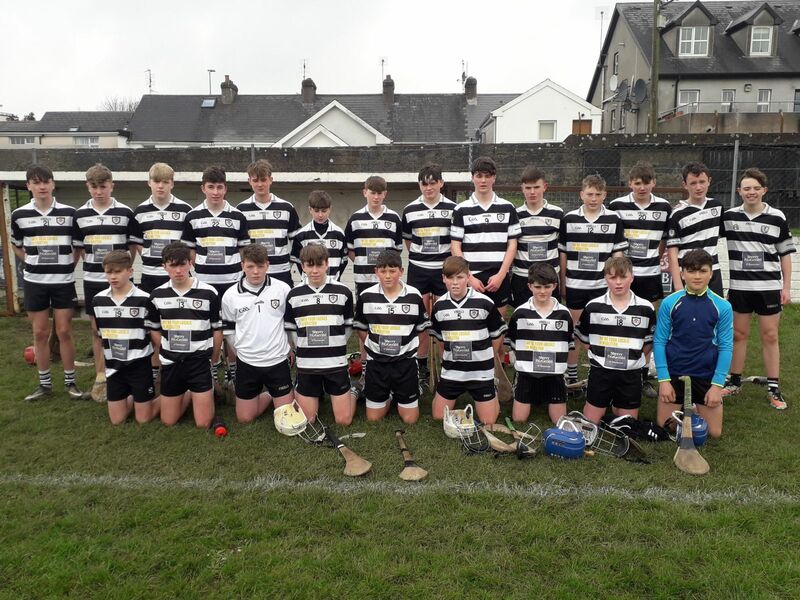 Hurling League Midleton v Na Piarsaigh - The second round of the Premier 1 Hurling league for our U15 hurlers was a home game versus Na Piarsaigh. Conditions in Clonmult Park field were excellent considering the recent weather. The match was played Saturday afternoon April 14th. As usual there was another great turnout of players for this game. We started very strongly against this very fancied Na Piarsaigh side. Alex Quirke converted two difficult frees. Phelim Magann was first to score from play for the young Magpies. Adam Fay and Alex then kept the scoreboard ticking over with another brace of frees from Alex and a neat finish from Adam. Evan Kelly then cut loose with three scores in almost as many minutes (1-02). The first half finished out with scores from Phelim (0-01) and Alex (0-02). From this strong position at half time our boys were able to hold a comfortable lead for the duration of the second half. James Condon on his introduction got off the mark with a fine point from play. Panel: Brion Saunderson, Lam McGrath, Fintan Greenwood, James O’Sullivan, Adam Fay (0-01), Ciarmhac Smyth, Evan McCarthy (1-02), Evan Kelly, Darragh Codd, Kelvin Barry, David Cremin (0-04), Mikey Finn, Alex Quirke (0-09 (0-07f)), James Condon(0-01), Cian Murray, Ben O’Neill, Rory Hartnett Neil Fitzgerald, Tomas Lambe, Niall Corcoran, Phelim Magann (0-02), Craig Collins, Roan Spillane, Shay Bohan & John Spellman.